Our expert Fire Risk Assessors have been carrying out Fire Risk Assessments and annual reviews for all types of business in London, Surrey, and the South-East, for 20 years. All businesses and blocks of flats must have a valid Fire Risk Assessment to comply with regulations – in fact, it’s the cornerstone of your fire safety plans. 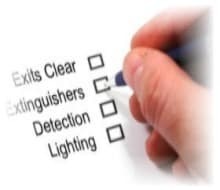 Most importantly, if your building has more than 4 regular occupants, then the findings of your Fire Risk Assessment must be set down in writing – read more in our blog. Our team of Fire Risk Assessors have many years’ experience between them, often with a background in the Fire Brigade. Our Assessors are either Fire Brigade trained, or carry Fire Protection Industry accreditations, so you can be confident they are adhering to the latest regulatory guidelines when they give you advice. We will carry out a thorough assessment of your premises and provide a detailed report, including recommendations and a prioritised action plan. As well as carrying fire industry accreditations, we are SafeContractor and CHAS approved, and certified to ISO9001, so you can be confident that you will receive the best possible service and advice. A thorough fire risk assessment could mean the difference between top quality fire protection and putting your business and employees at risk. If you’re in the London area and your fire risk assessment is due, or you’re concerned your current one may need refreshing, we can complete a full new fire risk assessment and provide the supporting documentation within 2 weeks, so that your business is kept fully up to date.